*First Author, College of Health Industry, Eulji University, Korea. E-mail: dydals2v@naver.com. Kurmangazy 29, 050010 Almaty, Kazakhstan. Received: October 09, 2013. Revised: December 29, 2013. Accepted: March 17, 2014. Purpose - This study analyzed the characteristics of socialnetworking sites (SNSs) using related literatures, and researchedthe models discussed in precedent studies, to investigate the effectsof SNS characteristics upon consumers’awareness, purchaseintention, and recommendation. The purpose of the studywas to investigate the use of SNSs as a marketing tool. Design, methodology, and approach - For an empirical analysis,the author distributed questionnaires online and offline, toverify the models and hypotheses. Respondents were personsaged 17 or older, who were frequent users of SNSs. The questionnairesurvey was conducted for 11 days from September 30,2013 to October 10, 2013. The author distributed 450 copiesand received 430 responses. Finally, 412 copies were used forthe analysis after excluding 18 copies having poor answers. Results - The findings about SNS users' behavior could beused as material in the future use of SNS as a marketing tool.Further, the study provided not only theories about SNS characteristics,but also variables and items that were verified duringthe empirical study. Conclusions - Further studies are needed to overcome thelimitations and to establish various kinds of SNS marketingstrategies in detail. JEL Classifications : L14, L39, O32. SNS, that is to say, social network service, produces and strengthens relations with friends and/or seniors and juniors to communicate and share information. SNS - interactive multiuser web site, the content of which is filled by participants of a network. SNS is an automated social environment, which enable to communicate with a group of users with a common interest. These include thematic forums, which is actively developing lately. All users can share personal information with friends, professional background and interests with colleagues, or potential partners for cooperation. SNS includes Facebook, Linked In and My Space to start it by Cyworld in the nation. eMarketer, a market research agent, said that as many as 1.2 billion persons made use of SNS one time or more a month every month as of December 2011 to be likely to continue by 2014. In other words, 2.2 billion persons that was 31.4% of 7 billion persons in the world made use of Internet, and 2.2 billion persons who were 54.5% of Internet users made use of SNS (eMarketer, 2012). Enterprises made use of SNS to do marketing owing to rapid increase of SNS users. As a result, enterprises could save time and costs to elevate familiarity and reliability by better communication with consumers and to keep long term relations. SNS supplied information by mutual reaction to give feedback to customer reaction and to do marketing effectively. Effective use of SNS was thought to be important to establish marketing strategies of individuals and/or businesses that made use of SNS as marketing tool: This study examined effects of characteristics of SNS. For purposes of this study we focus on the use of SNS. However, it should be noted that the use of SNS is becoming increasingly complex communicative practice inseparably connected with the diversification of media practice. Research in this area tends to refer to a new sphere of innovative discoveries of the 21st century. There are, however, substantial evidence of the benefits associated with the use SNS, which is often ignored in the public debate. In this article summarizes the available evidence relating to the beneficial effects of SNS in the context of consumers’ awareness that had influence upon purchase intention and recommendation. This study is quite unique in that found out characteristics of SNS by using SNS related literatures, and researched models of precedent studies, and investigated effects of characteristics of SNS upon consumers’ awareness, purchase intention and recommendation. The purpose of the study was to investigate use of marketing tool of SNS. First, the study kept SNS concept and characteristics and usage state of SNS users in order by using literature, Internet and other media. Second, the study investigated effects of variables of characteristics of SNS upon consumers’ awareness. Third, the study investigated effects of characteristics of SNS upon consumers’ awareness that had influence upon purchase intention and recommendation. Lastly, the study verified effects of characteristics of SNS to find out factors and to give implications for marketing strategies and effective use of SNS. The rest of the manuscript is organized as follows. In Section 2, the concept of SNS and concept and precedent studies of the variables are described. Section 3 presents a methodology, in particular recommend models and hypotheses, and Section 4 describes the details of the experiment and evaluations. Finally, Section 5 concluding part. In recent years, enterprises are increasingly aware that staff is a real storage of knowledge and that the real knowledge management is supporting communications and establishment of contacts between the employees. This is especially emphasized the Richter and Koch (2008), emphasizing that people are a kind of platform data and that the development of social networks can increase the production and speed up the dissemination of innovation. In its part Davenport and Prusak (1998) indicated that the high potential network interaction employees to increase productivity and accelerate innovation in enterprises. SNS used for various purposes, of which the most obvious is the network. This can be a network not only in personal context, but in a professional context. Therefore there is an increased prevalence of SNS with large amounts of information and data available to the consumer. There are different forms of SNS which "allow individuals to present themselves, articulate their social networks, and establish or maintain connections with others"(Ellison et al., 2007). SNS, social network service, is said to be online service, platform and site that have mutual network and sharing between the ones who share interests and activities to do social networking (Seol, 2011). SNS that allows users to share contents has easy interlocking with external networks to give users convenience and to have very good expansion. Classmates.com, the first SNS, launched service in 1995. The online site built up online network by using a list of friends. So, consumer SNS are social networking websites, which are open to the public. In South Korea, in 2001, 'Cyworld' started to expand SNS market (Lee, 2013). In Kazakhstan social networks came later, in 2007 with the advent of ‘Kiwi’, ‘Yvision’ and ‘Jnet’. It should be noted that organizations, which learn and adapt of SNS will have a distinct advantage in the market and ultimately increase their productivity (Caloisi, 2008). Since 2007, number of SNS users rapidly increased as much as 174% (Lee, 2013). Internet users got access to SNS site one minute per 5 minutes. One third of SNS users in the world lived in Asia an Pacific rim. And, in Latin America, one of Internet user spent 7.6 hours on average to get access to SNS. Facebook took the lead in social network service business, followed by Twitter and Google Plus. In January 2013, Global Web Index said that Google Plus had the largest number of users based on active usage, followed by Twitter, YouTube and Twitter in order. Facebook had the largest number of users of 670 million users as of last day of December 2012 based on active usage, followed by 340 million users of Google Plus and 280 million users of YouTube (Forbes, 2013, January). 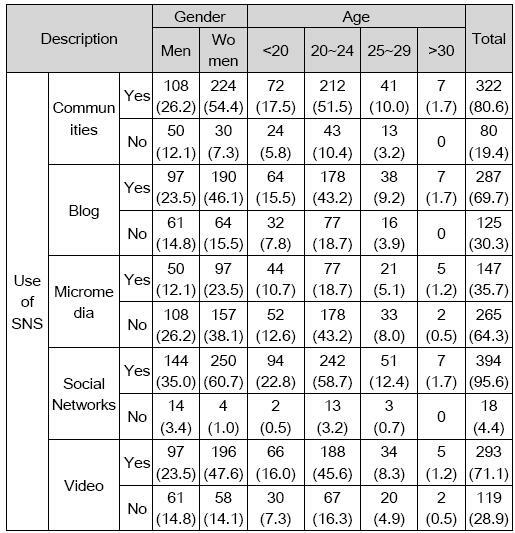 2012 Korea Media Panel Survey, a survey on nationwide media panels, was done to investigate 4,432 households and 10,319 persons by questionnaires of household, individuals and media diary (Shin, 2013): 23.5% of the interviewees said use of SNS, and in particular, SNS usage in their twenties accounted for 61% to be much higher than that of other age groups. The questionnaire was consisted of two sections. The first section consisted of questions capturing the social network sites and online shopping mall using information, such as "How many times you visit the online shopping mall in the day? ", "What kind of social network services are you mainly using?" and other. The second section consisted of nationwide media panels’service introduction scenario and in this section we made a point scale (from 1 to 5). 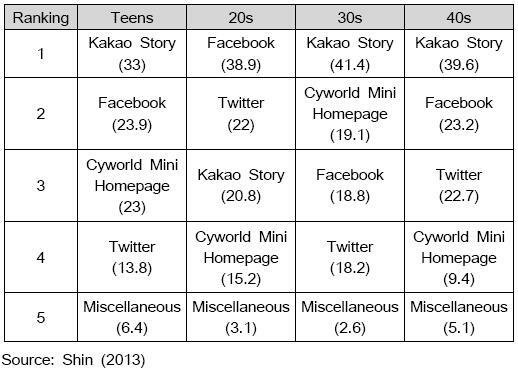 Utilization rate of SNS varied a little depending upon ages, and the ones in their teens, thirties and forties often made use of Kakao Story, and the ones in their twenties did Facebook (Shin, 2013). In each of the previous studies, and does not override variables for this study would like to take advantage of the independent variables. The interaction means actions and/or effects between two or more persons and between two or more media (Liu & Shrum, 2002). The interaction expanded concept in multi-dimension way to exchange and share information between sender and user and to create values jointly (Kim et al., 2008). The characteristics of SNS included mutual connections (Shuo & Lee, 2012) and Yang & Kim, 2013). In this study, good interaction was assumed to have affirmative influence upon consumers’ awareness in accordance with precedent studies. Consumers are allowed to share information on product and services by SNS and to make decision easily. Consumers rely upon the information by sharing experience (Cho et al., 2012). Generally speaking, consumers who have experienced consumption could accumulate information on the service and make final decision based on the information (Smith & Swinyard, 1982). The information service is said to give users various kinds of contents at the use of SNS service (Hong, 2012), and information service of SNS had positive influence upon consumers’ awareness. In this study, consumers’ awareness might vary depending upon supply of the information according to precedent studies. Compensation, motivation and pleasure were needed to make use of SNS effectively and to develop community. Good quality information and contents and easy retrieval are important, and pleasure, happiness and other enjoyment factors shall be actively supplied (Lee, 2012). SNS has characteristics of pleasure, interaction and relations (Pfeil et. al., 2009), and consumers have interests and pleasure at exchange of messages in the use of services (Lee et al., 2012). Consumers can experience pleasure, practice and values in the use of SNS at the same time (Jones et. al (2006), and self-efficacy, pleasure and learning purpose have significant influence upon use of the system at the study on forecast of web based information system (Yi & Hwang, 2003). The enjoyment was assumed to have influence upon consumers' attitudes according to precedent studies. The reliability is said to be a receiver's cognition on the supply of unprejudicial opinions and/or objective information with knowledge, technology and experience of communication subject (Belch, 1990). Users shall be given reliability to elevate customer loyalty online by saying reliability on blog review information (Chu & Roh, 2012), and reliability of the information source may have the greatest influence upon attitude to the product (Kim et al., 2011). High reliability was found to have great influence upon attitude at precedent studies: In this study, reliability of SNS was assumed to have affirmative influence upon attitude to the product. The consumers’ awarenessis said to be tendency that consumers take either favorable or unfavorable actions on the product (Allport, 1953). The attitude can be made not by born but by an individual's experience depending upon specific object and/or situation. The attitude expresses internal impression that reflects an individual's favorable and/or unfavorable inclination against an object, and it cannot be watched by results of psychological course to infer it by an individual's sayings and/or behavior (Cho et al., 2012). In this study, consumers' attitude was thought to be important at selection of the product. The purchase intention that consumers want to buy products means an individual's intention of specific behavior at the marketing (Cho et al., 2012). Marketing managers make use of consumers' purchase intention to evaluate not only concept of alternative products but also subject of the advertising. The purchase intention is said to be probability that makes change of either behavior expected or future behavior planned of individuals into belief and/or attitudes (Engel and Blackwell, 1982). 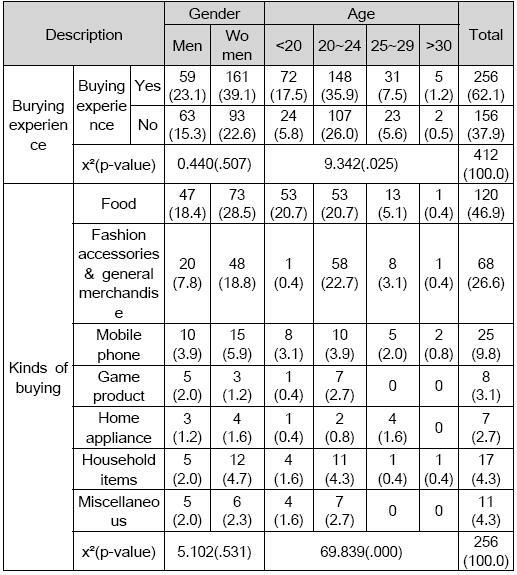 Distribution of SNS had relation with purchase intention in the Korean society (Kim et al., 2012). The recommendation informs friends, intimates and family members of experience of satisfactory and/or unsatisfactory product (Rinchins, 1983). and it gives information of product and/or services by dialog regardless of individual's commercial interests (Chun & Park, 2011). This study investigated effects of SNS effects upon consumers’ awareness, purchase intention and recommendation, and developed models. Independent variables of interaction, supply of the information, enjoyment and reliability were used in accordance with studies of not only Agarwal & Venkatesh (2002) but also Mckinny et al. (2002). Parameters included attitude to the product (Lee et al., 2004), and dependent variables did purchase intention and recommendation (Tylor & Baker, 1994) (Fig 1). So, in research presents a model, which is intended to explain the role of the perceived benefits of using social networking sites and integration of services. S-O-R model of consumer behavior evolves from the simple return value to the final model. Stimulus is conceptualized as an influence that causes a person. It is the factor that affects all the processes, these factors include all objects, namely, products, brands, logos, advertisements, packages, rates, shops and storage conditions, word-of-mouth communication, and countless other factors (Jacoby, 2002). Model studies on the basis of the S-O-R model (stimulus-organism-response), in the framework involves the motivations of using social networking sites and integration of online sites impact on satisfaction and perception of the internal conditions that intervene with the behavior of responses (purchase intention). Hypothesis 1. The characteristics of SNS has positive influence upon consumers’ awareness. 1-1. The interaction of SNS has positive influence upon consumers’ awareness. 1-2. The information-provide of SNS has positive influence upon consumers’ awareness. 1-3. The enjoyment of SNS has positive influence upon consumers’ awareness. 1-4. The reliability of SNS has positive influence upon consumers’ awareness. The consumers’ awareness has affirmative influence upon product quality and values to have influence upon continuous selection of the product (Dodds et al., 1991). Hypothesis 2. The consumers’ awareness has positive influence upon purchase intention. Hypothesis 3. The consumers’ awareness has positive influence upon recommendation. This study investigated effects of characteristics of SNS upon consumers’ awareness that had influence upon purchase intention and recommendation. SNS literature and empirical analysis were used. The study examined characteristics of SNS such as interaction, information-provide, enjoyment and reliability by using literature and theses at home and abroad and Internet material. At empirical analysis, the author distributed questionnaire online and offline to verify models and hypotheses. The subject was the ones who were 17 years old or higher to be likely to make use of SNS frequently. The questionnaire survey was done for 11 days from September 30, 2013 to October 10, 2013. The author distributed 450 copies and collected 430 copies. And, 412 copies were finally used for the analysis after excluding 18 copies having poor answers. Cronbach's αand factor analysis were used. Regression analysis was done to investigate effects of characteristics of SNS upon consumers’ awareness, and regression analysis was done to investigate effects of characteristics of SNS upon purchase intention and recommendation. SPSS 18.0 was used. 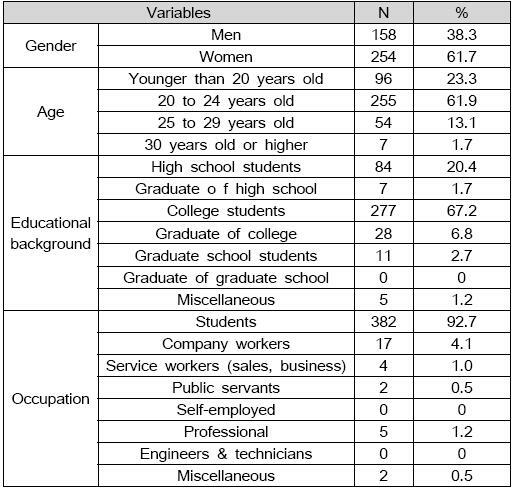 The interviewees had demographic characteristics (Table 4). Men occupied 38.3%, while women did 61.7%. The age was in order of 20 to 24 years old (61.9%), younger than 20 years old (23.3%), 25 to 29 years old (13.1%) and 30 years old or higher (1.7%). The ones who were 20 to 24 years old answered at the highest ratio because the questionnaire survey was done mainly at colleges. The educational background was in order of college students (67.2%), high school students (20.4%), graduate of colleges (6.8%), graduate school students (2.7%), graduate of high school (1.7%) and miscellaneous (1.2%). The interviewees had occupation, for instance, students (92.7%), company workers (4.1%), professionals (1.2%), service workers (sales, business) (1.0%), public servants (0.5%) and other jobs (0.5%). This study investigated experience of each type of SNS to find out use of SNS. Type of SNS was classified into Communities (Daum, Naver Cafe), Blog (Daum, Naver blog), Micromedia(Twitter, me2day), Social Networks (Facebook, Cyworld and Kakao Story) and Video(YouTube). The interviewees experienced social networks (Facebook, Cyworld and Kakao Story) the most (394 persons, 95.6%), followed by communities (Daum, Naver Cafe) (322 persons, 80.6%), video (YouTube) (293 persons, 71.1%), blog (Daum, Naver blog) (287 persons, 69.7%) and micromedia (twitter, me2day) (147 persons, 35.7%) in order. The interviewees preferred social networks (Facebook, Cyworld, Kakao story) the most. The ones who were 20 to 24 years old had significant difference (P<.05). The interviewees often made use of SNS less than one hour a day. Men often made use of SNS less than one hour a day, and women did 2 to 3 hours a day. The interviewees made use of smart phone the most (91.3%), and SNS media were not independent at the gender (P<.05). See Table 8 of SNS media. Purposes of useof SNS were: The interviewees made use of SNS for leisure and hobby (29.6%), followed by communication (27.2%), learning of information and knowledge (19.2%), self-expression (11.9%), and human relation management (8.5%) in order. Men made use of SNS for leisure and hobby (11.2%), while women did for communication (19.2%) (P<.05). The ones less than 20 years old made use of SNS for communication (8.0%), and the ones who were 20 to 24 years old did for leisure and hobby (18.4%), and the ones who were 25 to 29 years old did for self-expression (3.4%) and the ones who were 30 years old or more did for learning of information and/knowledge (0.7%), and purposes of the use were not independent depending upon ages (P<.05). 62.6% of the interviewees participated in an event of SNS in order of free gift (38.8%), joint purchase (32.2%), discount coupon (21.3%) and miscellaneous (5.4%). The interviewees participated in an event by ages: joint purchase of the ones who were less than 20 years old (16.7%), free gift of the ones who 20 to 24 years old (31.4%), and joint purchase of the ones who were 25 to 29 years old (5.0%), and joint purchase of the ones who were more than 30 years old (1.2%). The interviewees (62.1%) said that they experienced buying of an event of SNS, for instance, food (46.9%) to be the highest, followed by fashion accessories and general goods (26.6%), mobile phone (9.8%), household items (4.3%), miscellaneous goods (4.3%), game (3.1%) and home appliances (2.7%) in order. Kinds of buying varied depending upon ages: So, the ones who were less than 20 years old bought food (20.7%) the most, and not only the ones who were 20 to 24 years old but also the ones who were 25 to 29 years old did fashion accessories (22.7%) and general merchandise (3.1%), and the ones who were 30 years old or more did mobile phone (0.8%). This study investigated factors of test items of each variable to examine factors of 29 items. The study investigated factors by varimax rotation to regard 0.50 or more of factor loading as an important variable. The study excluded questions with low factor loading (information supply 4). Cronbach'α was used to verify internal consistency between questions. Cronbach'α was 0.70 or higher to test specific items at reliable level. 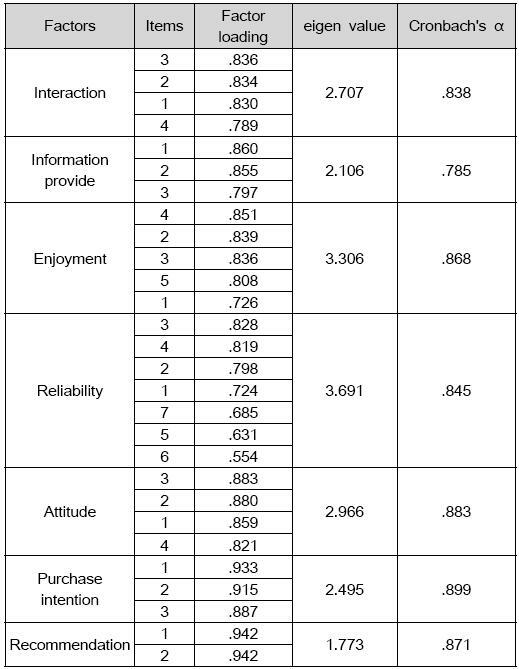 Regression was used to test hypothesis 1 of "SNS characteristics has positive influence upon consumers’ awareness " (Table 13). Regression R-square of 25.6% and F of 32.064(p<.000) were significant (0.05) (Table 13). The interaction and information-provide were not significant to have no correlation, and both enjoyment and reliability had influence upon consumers’ awareness. The study partially adopted hypothesis 1 that both enjoyment and reliability had positive influence upon the consumers’ awareness. Regression R-square of 56.2% and F of 513.992(p<.000) were significant (table 14). Hypothesis 2 of "The consumers’ awareness has positive influence upon purchase intention" was adopted. Hypothesis 3 of "The consumers’ awareness has positive influence upon recommendation" was adopted (table 15). Regression R-square of 45.6% and F of 332.436(p<.000) were significant (table 15). Hypothesis 3 of "The consumers’ awareness has positive influence upon recommendation" was adopted. First, the interviewees made use of social networks such as Facebook, Cyworld and Kakao Story the most, followed by communities (Daum and Naver Cafe, 322 persons, 80.6%), video (YouTube, 293 persons, 71.1%), blog (Daum, Naver, 287 persons, 69.7%) and micromedia (Twitter, me2day, 147 persons, 35.7%) in order. The interviewees preferred social networks such as Facebook, Cyworld and Kakao Story the most. 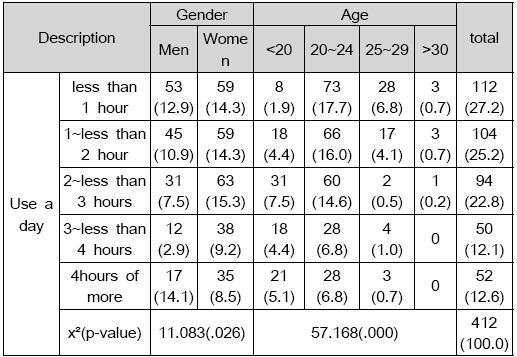 The interviewees often made use of SNS less than one hour: Men often made use of SNS less than one hour a day, while women did 2 to 3 hours a day. The interviewees made use of smart phone (91.3%) the most among media owing to distribution of smart phone and less sales of feature phone. The purpose of use of SNS was leisure and hobby (29.6%), followed by communication (27.2%), learning of information and/or knowledge (19.2%) and self-expression space (11.9%) and human relation management (8.5%) in order. Men made use of SNS for leisure and/or hobby (11.2%), while women did for communication (19.2%). The ones younger than 20 years old made use of SNS for communication (8.0%), and the ones who were 20 to 24 years old did for leisure and hobby (18.4%), and the ones who were 25 to 29 years old did for self-expression (3.4%), and the ones who were 30 years old or higher did for learning of information and/or knowledge (0.7%). The interviewees (62.6%) participated in an event on SNS, for instance, free gift (38.8%), group purchase (32.2%), discount coupon (21.3%) and others (5.4%). The ones who were younger than 20 years old did group purchase (16.7%), and the ones who were 20 to 24 years old did free gift (31.4%), and the ones who were 25 to 29 years old did group purchase (5.0%), and the ones who were 30 years old or higher did group purchase (1.2%). The interviewees (62.1%) bought by an event on SNS, for instance, food (46.9%) followed by fashion product and/or general goods (26.6%), mobile phone (9.8%), household items (4.3%), miscellaneous (4.3%), game product (3.1%) and home appliances (2.7%) in order. The ones who were younger than 20 years old often bought food (20.7%), and the ones who 20 to 24 years old did fashion product and/or general goods (22.7%), and the ones who were 25 to 29 years old did fashion product and/or general goods (3.1%), and the ones who were 30 years old or higher did mobile phone (0.8%). First, the findings of SNS users' behavior could be used to be marketers' material for marketing tool of SNS in the future. And, the study gave not only theories of SNS characteristics but also variables and test items that were verified at empirical study. Women mostly made use of SNS to communicate with friends, school seniors, school juniors and intimates and so on: Postscript and/or experience story of SNS users could create interests of SNS users who had no information on brands and/or products, and they might help intimates and/or friends share the information. And, compensation for the visit, comments and times of sharing could help SNS users visit and join regularly. The interviewees were found to join free gift events provided by individuals and/or enterprises. Events joined by SNS users allowed enterprises to advertise brands and/or products with small amount of expenses. The communities (Daum, Naver Cafe) that was another type of SNS had members of groups having same purpose to produce better marketing effects. Second, both enjoyment and reliability had affirmative influence upon consumers’ awareness: So, SNS users thought much of not only enjoyment but also reliability in the use of SNS. The users should be given pleasure and interests to devote them to SNS and to be given reliability to rely upon not only SNS functions but also product itself and to make use of SNS continuously. Third, characteristics of SNS had affirmative influence upon purchase intention and recommendations. The consumers’ awareness according to characteristics of SNS could help customers have buying mind, and customers who experienced buying expressed their experience on SNS to have influence upon purchase intention of potential customers: So, SNS was likely to be new marketing tool and channel. Lastly, in information age, SNS is thought to be important communication media and obtained results can be used not only in South Korea but also in many other countries . SNS can do immediate action to the customers after being given service, quick inspection into phenomenon and supply of exact services enough to satisfy customers. First, in this study, variables of characteristics of SNS were not enough to reflect characteristics of SNS. Further studies were needed to investigate many theories and to define variables of various kinds of characteristics and to research exactly and widely. Second, this study investigated not only high school students but also college students not to research the ones in various kinds ofage groups. Further studies should collect information from wide range of age groups based on objective and general sampling. Third, this study investigated by empirical analysis based on precedent studies and did not give additional variables. 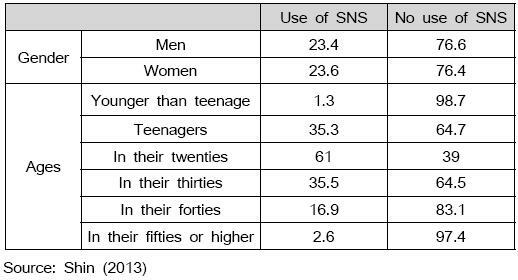 SNS users' ages should be widened considering young ages of smart phone users. An investigation with parameters of not only non-adult but also adult could investigate customized marketing. Further studies were needed to supplement the limitations and to establish various kinds of SNS marketing strategies in detail. 1.Allport, F. H. (1953). The effect of segregation and the consequences of desegregation: A social science statement. Minnesota law review, 37, 429-440. 2.Agarwal, R., & Venkatesh, V. (2002). Assessing a Firm's Web Presence: A Heuristic Evaluation Procedure for the Measurement of Usability. Information Systems Research, 13(2), 168-186. 3.Caloisi, G. (2008). Social networks at work. AV Magazine, 14-15. 4.Cho, Young-Sang, Heo, Jeong-Yoon & Youn, Myoung-Kil(2012). Korean Customer Attitudes Towards SNS Shopping. Journal of Distribution Science, 10(8), 7-14. 5.Chu, Wu-Jin, & Roh, Min-Jung (2012). 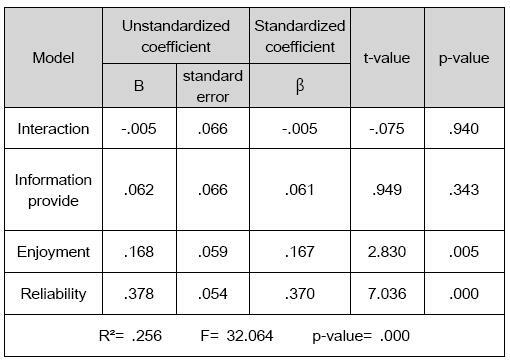 The Effect of Consumers` Value Motives on the Perception of Blog Reviews Credibility: the Moderation Effect of Tie Strength. Asia Marketing Journal, 13(4), 159-189. 6.Chun, Tae-Yoo, & Park, No-Hyun (2011). The Effect of Measurements on Customer`s Positive Emotion, Relationship Quality, Word of Mouth, and Recommendations in Convention Industry. Korea Logistics Review, 21(3), 88-111. 7.Davenport, T, & Prusak, L. (1998). Working knowledge, Boston, MA. : Harvard Business School Press. 8.Dodds, William B., Monroe, Kent B., and Grewal, Dhruv (1991). Effects of Price, Brand and Store Information on Buyers' Product Evaluations. Journal of Marketing Research, 28 (August): 307-317. 10.Engel, J. F., and Blackwell, R. D. (1982). Consumer Behavior (4th ed). Chicago, IL: Dryden Press. 11.Ellison, N.B., Steinfield, & C., Lampe, C. (2007). The benefits of Facebook ''Friends:'' Social capital and college students'use of online social network sites, Journal of Computer-Mediated Communication, 12, 1143–1168. 13.Jacoby, J. (2002). Stimulus-Organism-Response Reconsidered: An Evolutionary Step in Modeling (Consumer) Behavior, Journal of Consumer Psychology, 12 (1), 51-57. 15.Kim, Eun-Mee, Lim, Sohye, & Ham, Sun Hea (2008). Effects of Interactivity and Involvement in the User's Information Processing and Emotional Responses. Korean journal of journalism & communication studies, 52(4), 250-277. 17.Kim, Wanki, Lee, Suk Jun, & Youn, Myoung-Kil (2012). Portfolio for Social Commerce Growth Using Customer Repurchase Intention Factors: The Case of Korea. AISS: Advances in Information Sciences and Service Sciences, 4(23), 1-15. 18.Liu, Y., & Shrum, L. J. (2002). What is interactivity and is it always such a good thing? Implications of definition, person, and situation for the influence of interactivity on advertising effectiveness. Journal of Advertising, 31(4), 53–64. 19.Seol, Jinah (2011). Social media and social change. Seoul, Korea: Communication Books. 20.Lee, Joo-Young (2013). Status and utilization of social media services. Broadcasting and Communications Policy, 25(9), 45-56. 21.Lee, Moonkyu, Kim, Tae-Young, and Kim, Hyun-Kyung (2004). The Effects of Brand Community on Consumer Attitude. Korean Marketing Review, 19(3), 197-224. 22.Lee, Nae-Joon (2012). 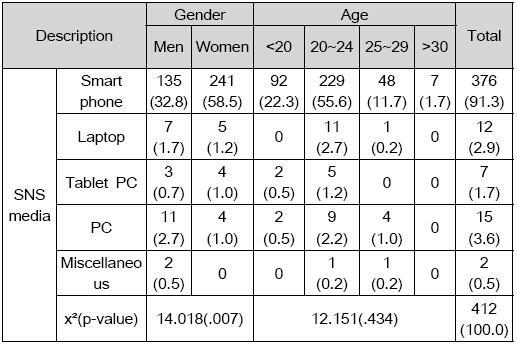 Comparative Analysis of Intention to Use Toward Smartphone Between Korean and Chinese Consumers. Korea Logistics Review, 22(4), 99-127. 24.McKinney, V., Yoon, K., & Zahedi, F. (2002). The Measurement of Web-Customer Satisfaction: An Expectation and Disconfirmation Approach. Information System Research, 13(3), 296-315. 25.Pfeil, U., Arjan, R., & Zaphiris, P. (2009). 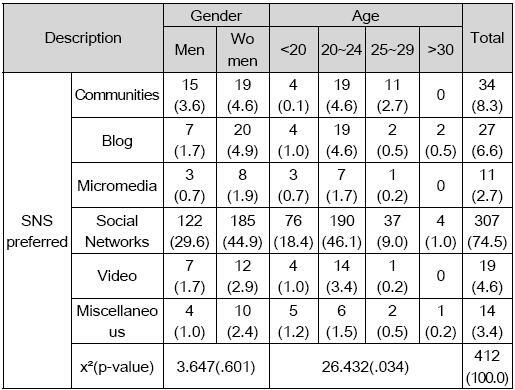 Age differences in online social networking: A study of user profiles and the social capital divide among teenagers and older users in My Space. Computers in Human Behavior, 25, 643-654. 26.Richins, M. L. (1983). Negative word-of-mouth by dissatisfied customers : a pilot s tudy. Journal of Marketing, 47, 68-78. 27.Richter, A., & Koch, M.(2008). Functions of Social Networking Services. In: Proc. 8TH International Conference on the Design of Cooperative Systems, Carry-le-rouet, France, Institut d'Etudes Politiques d'Aix-en-Provence, 87-98. 28.Shuo, Zhang, & Lee, Jong-Ho (2012). A study on the development and prospect of social media Korea VS. China. Journal of KECRA, 13(1), 3-22. 29.Shin, Sun (2013). SNS (social network service) usage. KISDI STAT Report, 13(4), 11-15. 30.Smith, R. E., and Swinyard, W.R.(1982). Information Response Models: An Integrated Approach. Journal of Marketing, 46, 81-93. 31.Taylor, S. A., and Baker, T. L. (1994). An Assessment of the Relationship between Service Quality and Customer Satisfaction in the Formation of Consumers'Purchase Intentions. Journal of Retailing, 70(2), 163–178. Copyright © KODISA. All rights reserved.